Mount Jopuno is positioned in western Sikkim at a lofty elevation of 5936 meters. 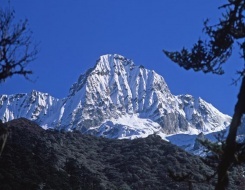 This imposing peaks lies under Kangchendzonga National Park. This splendid peak can be clearly seen from Okhlathang valley while trekking to Goecha La Pass. Mount Jopuno is a prime attraction among the mountaineers from all around the blue planet. A trekker can relish the mesmerizing views of some of the most wonderful mountains of Sikkim Himalayas. Trekking to Mount Jopuno allows the trekkers to relish some of the beautiful sites like Yuksom, Dzongri, Thangsing and Goecha La. These intact places are renowned for their paramount exquisiteness and serenity. This 15 nights and 16 days itinerary takes the travelers to the comprehensive and hair-rousing trek to Mount Jopuno. The tour is perfect for the trekkers with an inclination towards nature's opulence along with for those who want to satiate their adrenaline rush in the midst of virgin ambiance. In the morning, we will take flight from Delhi to Bagdogra. On arrival in Bagdogra, meet our representative and drive towards Gangtok. On arrival in Gangtok, check in at the hotel. Evening is free for sightseeing and acclimatisation. Enjoy dinner followed by an overnight stay in the hotel. Today in the morning, we will drive to Yuksom, the base of our trek. Enjoy dinner and an overnight stay in guesthouse/tents. In the morning, we will start the trail from Yuksom starts at the local market and follows the main road towards the north. Thereafter, climbs gently out of the valley and hugs the right bank of the Rathong Chu River, which can be heard thundering through the gorge below. Further, we will cross over four bridges to climb steeply towards north-west to the small settlement of Bakkhim. Continue for another 3 kms through forest of magnolia and rhododendron to reach Tshoka. On arrival at set campsite, have dinner and an overnight stay. Today, we will follow the trail that passes through the village of Tshoka and continues to climb north through the forest of rhododendron to the alp of Phedang (3650 m) taking around 3 hrs to complete the ascent. Further, we will continue following the trek towards Dzongri. On arrival at set campsite, enjoy dinner followed by an overnight stay. The day is for acclimatization at Dzongri. In the morning, we will follow the trail from Dzongri and continue alongside the right bank of the river towards east. After cresting the hill, the path drops into the valley and then crosses the bridge over the Prek Chu River. It is an hour climb from the bridge to Thangsing (3800 m), located on the slopes of Mt Pandim. Enjoy dinner and overnight stay in tent. Day 7 Thangsing (3800 mts) - Base Camp (approx. 4310m) 3 hrs. In the morning, we will approach to our base camp for Mt. Jopuno (5936 Mts) expedition. On arrival in the base of Mt. Jopuno set out camp for an overnight stay. The day is free for exploration and acclimatisation at the base camp followed by an overnight stay. Today, we will go for acclimatization ascent to camp 1 of Jopuno, set our Camp 1 and return to base camp. Enjoy an overnight stay at the base camp. Today, we will move to Camp 1, a steep ascent till Camp 1 of Jopuno. Overnight stay at Camp 1. Today early in the morning at around 3 am, we will leave from Camp 1 to Summit of Jopuno. Our climbing guide will lead the route. It will be a steep climbing till summit of Jopuno. After seeing panoramic view of surrounding, we will click some pictures in Summit and will descend back to Camp 1. The day is reserved for Summit in case of bad weather or any other unexpected circumstances. Today, we will descend from Camp 1 to the base Camp. Enjoy a night stay at the base camp. In the morning after breakfast, we will leave to return trek to Thangsing via Goecha La pass. Overnight stay at the camp in Thangsing. After breakfast in the morning, we will trek to reach Tsokha. It will take nearby 5 - 6 hrs. The trek winds its way down up to Phedang, the start of the Rhododendron trail. Overnight stay in tents. Today, we will descend to the Prek Chu following the same route that took us up on the first day, and then contour gradually downwards to reach the village of Yuksam our starting point. Later in the afternoon, we will drive to Gangtok. Enjoy an overnight stay at the hotel in Gangtok. In the morning after breakfast, we will drive to Bagdogra. Thereafter, take flight for onward destination. End of tour and services.